Who’s the phony one here? Rush or the soldiers from Vote Vets? Who does General Pace report to? General Peter Pace is the chairman of the joint chiefs, making him the most elevated military office in the United States. He is not our priest-in-chief or our parent-in-chief, but he seems to think he is, and that his “upbringing” and his beliefs make him qualified to tell the rest of us, the entire military, and the United States Senate what is immoral. Why is that his job? It isn’t, but he doesn’t seem to know that! The first amendment to the United States Constitutions says that “Congress shall make no law respecting an establishment of religion, or prohibiting the free exercise thereof; or abridging the freedom of speech, or of the press; or the right of the people peaceably to assemble, and to petition the Government for a redress of grievances.” This may be why Pace refers to his upbringing and not his religion, but it is commandments from his RELIGION that is causing him to repeatedly condemn homosexuality and adultery. My upbringing is such that I believe that there are certain things, certain types of conduct that are immoral. I believe that military members who sleep with other military members’ wives are immoral in their conduct, and that we should not tolerate that. I believe that homosexual acts between individuals are immoral, and that we should not condone immoral acts. So the Don’t Ask, Don’t Tell allows an individual to serve the country, not — [inaudible] that allows individuals to serve their country. If we know about immoral acts, regardless of committed by who or — then we have a responsibility. And I do not believe that the Armed Forces of the United States are well served by saying through our policies that it’s okay to be immoral in any way, in any way, not just with regards to homosexuality. This is from that standpoint saying that gays should serve openly in the military to me says that we, by policy, would be condoning what I believe is immoral activity. And therefore, as an individual, I would not want that to be my policy, just like I would not want it to be our policy that, if were to find out that so-and-so was sleeping with someone’s wife, that we would just look the other way, which we do not. We prosecute that kind of immoral behavior between members of the Armed Forces. The Pentagon’s top general said Tuesday he should not have voiced his personal view that homosexuality is immoral and should have just stated his support for the military’s “don’t ask, don’t tell” policy in an interview that has drawn criticism from lawmakers and gay-rights groups. The written statement by Marine Gen. Peter Pace, chairman of the Joint Chiefs of Staff, did not apologize for his stance on homosexuality. 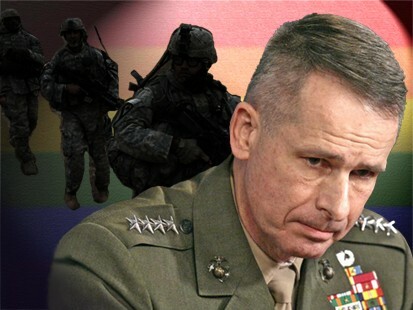 In a newspaper interview Monday, Pace likened homosexual acts to adultery and said the military should not condone it by allowing gays to serve openly in the armed forces. But ….. the general repeated all his opinions again this week in a Senate hearing, and this time the Code Pink protesters replied by quoting (very loudly and repeatedly) their favorite bible verse, “THOU SHALT NOT KILL! THOU SHALT NOT KILL!” They are absolutely correct — if we need any religion at all mixed in with the military, THAT is the kind of morality we should be following. No, not really, but aren’t they outrageous? I need a pair of these. Not for wearing, just for showing off. Are people in Houston crazy??? Don’t these people know that nuclear plants can have accidents? Why don’t they invite alternate energy companies to set up there instead? Is the economy so bad that they have to say yes to THIS? Egads!!!! HOUSTON — Despite objections from nuclear energy opponents, the proposed expansion of a Southeast Texas nuclear power plant has gotten the thumbs up from many locals, who say the project will be an economic boon. Richard Knapik, the mayor of Bay City, about 75 miles southwest of Houston, said Tuesday’s announcement that the owners of a nearby nuclear power plant want to double its size could pump as much as $6 billion into the local economy. It takes 14 paragraphs before the Chronicle mentions any possible negative aspects. But not everyone is as enthusiastic. The Sierra Club has consistently opposed the licensing, construction and operation of new nuclear reactors, in part because of concerns about industry oversight and the disposal of spent nuclear fuel. Nuclear power is produced when neutrons split the nucleus of uranium atoms, releasing heat that’s used to boil water and produce steam that drives a plant’s turbines. For now, spent fuel — which is radioactive waste — is contained inside the plants. “The U.S. has been down the nuclear power path — and it has proven to be expensive, polluting, dangerous and a security risk,” Tyson Slocum, the director of Public Citizen’s energy program said in a statement. The organization said companies like NRG and others expected to file applications with the NRC are destined to take advantage of federal loan guarantees and other subsidies at taxpayer expense. These suggestions are from Code Pink. 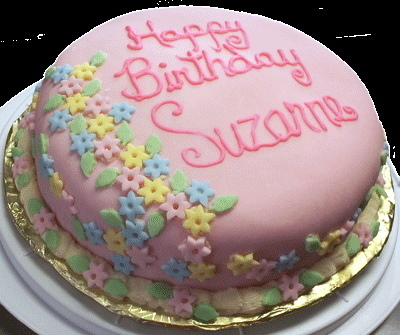 (Thanks Franya.) What else might work? Please leave a comment. 1. Tell Senator Lieberman: No War in Iran! Upon hearing these words, our own Leslie Angeline, a CODEPINK member from Santa Rosa, CA, decided to go on a hunger strike until Senator Lieberman agreed to meet with her. Leslie, who recently returned from a peace delegation to Iran, has made it her mission to prevent America from attacking the country. You can join us in solidarity by calling and emailing Lieberman’s office to demand that he retract his irresponsible call for military action in Iran. Call (202)224-4041 and ask to speak to Vance Serchuck, Lieberman’s Legislative Aide on foreign relations and Iran, or click here to send an email along with the picture on the above right of our action outside his office. We are holding photos taken from Leslie’s recent trip to Iran. Ask Lieberman if he really wants to attack these beautiful people, this beautiful place. See more action photos here. Download and distribute our latest DON”T IRAQ IRAN flyer! It is critical during this election season, to listen to what the presidential candidates – both Republican and Democrat – are saying about Iran. When a candidate says “No options are off the table,” they are sanctioning not only a possible military attack, but also a nuclear attack on Iran. This is totally unacceptable. We must insist that they put a nuclear attack off the table, and that they call for negotiations, not war. Click here to download our list of presidential candidates and their positions on Iran. 3. Sign Our Petition to the UN Security Council! Click here to add your name today! 4. Tell Congress! Don’t Iraq Iran! Help us prevent another war in the Middle East. This time Congress must stop a pre-emptive attack! Sen. Jim Webb (D-VA) has introduced legislation (S.759) that would prohibit any funds from the recent supplemental bill to be used in attacking Iran. Urge your Senator to support S.759 TODAY! 5. Ask Your Press to be Critical and Vigilant! The mainstream media is already jumping on the bandwagon about the Iranian threat. We hoped they would have learned their lesson after spreading falsehoods about WMDs in Iraq. But once again journalists such as New York Times’ Michael R. Gordon, Judith Miller’s sidekick in the WMD and phony aluminum tubes reporting, are quoting anonymous sources as proof that Iran is providing Iraqi militias with powerful explosives to attack US troops. For more analysis of the press and Iran, click here. In fact, the evidence against Iran is insubstantial and full of exaggeration. Even General Pace, the chairman of the Joint Chiefs of Staff, said he hasn’t seen any intelligence that supports the claim. We need to tell the press that now is the time to ask serious questions instead of blindly supporting the administration’s headlong rush into another tragic and unnecessary war. Please contact media outlets and tell them we demand a critical, vigilant press. Click here to send your letter now! In recent years, the media has damaged Iran?s image so badly that when people hear the name of Iran, they only picture black chadors, terrorism, and ayatollahs. These stereotypes are being constructed to make it easier for governments to attack Iran with public approval. This is why NoWar SA has produced a prsentation to help break down these negative stereotypes. This is from Progressive Democrats of America. Please call or email. 100,000 displaced. 65,000 families still living in FEMA trailers. This is the Gulf Coast two years after the devastation of Hurricane Katrina. After years spent dragging its feet, the Senate Committee on Banking, Housing and Urban Affairs is holding hearings today on the Gulf Coast Housing Recovery Act, the bill that will create a real road home for thousands of renters and owners in New Orleans and throughout the region. Tell Chairman Dodd (D-CT) and the committee to move the legislation and bring Katrina survivors home. Road Home program that really works, designate $1.7 billion for rental housing and earmark millions for community development programs. The legislation is finally on the agenda; let’s work together to make sure the Senate makes it a priority. Thank you for standing up for just recovery in the Gulf…and nothing less. Who would have the courage to do this today, 50 years later? She is a hero. 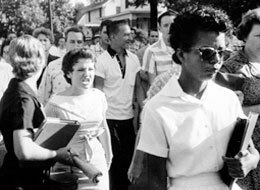 It was a school night, and Elizabeth Eckford was too excited to sleep. The next morning, September 4, 1957, was her first day of classes, and one last time she ironed the pleated white skirt she’d made for the occasion. It was made of pique cotton; when she’d run out of material, she’d trimmed it with navy-blue-and-white gingham. Then she put aside her new bobby socks and white buck loafers. Around 7:30 a.m. the following day, she boarded a bus bound for Little Rock Central High School.